The sounds of upbeat Israeli music, someone counting steps, and laughter fill a hallway of the Clarice Smith Performing Arts Center as Avirah, this university’s Israeli dance troupe, rehearses. Avirah members are on crunch time. They recently returned from Boston’s Israel Folkdance Festival on March 11, where they opened the show. Now, they are practicing for the Israeli Dance Festival D.C. on March 18. Avirah was formed in the 1990s, went on hiatus in 2006 and returned in the fall of 2013. It took the group four years to solidify Avirah’s existence on campus and re-establish its role in the community by attending festivals for example. No one in the current group was there when Avirah came off its hiatus, since all of those members have graduated. The troupe started this past fall with eight members and then added nine more after auditions. Co-presidents Jessica Morris and Adina Schwartz, along with five other executive board members, lead Avirah. 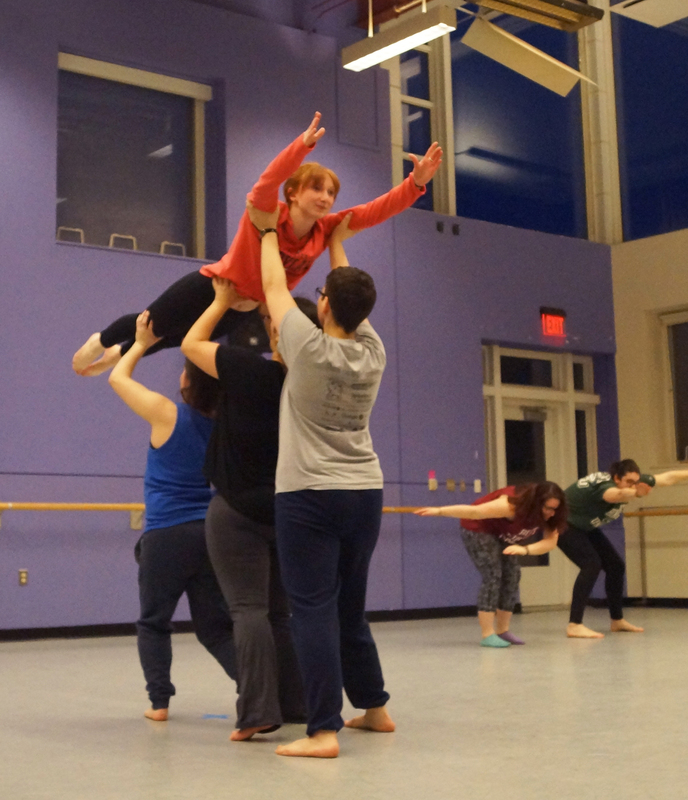 Members lift Sophia Godin as part of the routine. Haemee Lee/Mitzpeh. Every year, the troupe has one or two original choreographies made by members. Schwartz and Hannah Weisman, Avirah’s artistic director, choreographed this year’s routine, which includes traditional Israeli circle and pair dances and some modern elements. Weisman has danced since kindergarten at her Jewish day school, pioneered her sixth-grade dance troupe Kesem, and danced for four more years in her high school troupe Yesodot. Hannah Weisman (front) leads the group during rehearsal Wednesday night. Israeli dance can be described as a variety of steps and dances from Middle Eastern, Northern African, and even American cultures. 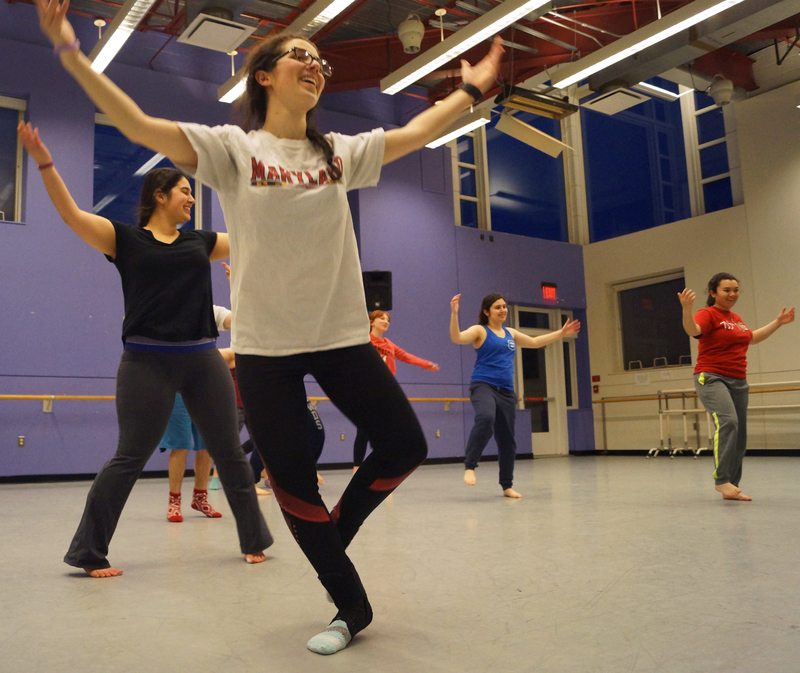 This fusion of cultures makes Israeli dance unique and not too difficult to learn, Avirah members said. Avirah not only creates a space for unique dance but also a supportive community that embraces everyone and their differences. Sarah Paley, Avirah’s treasurer, first experienced Israeli dance in elementary school and had not danced again until she joined the troupe this past fall. Besides festivals, Avirah performs at different campus events, cultural events, community centers and Hebrew schools. The group also holds open dance sessions, which encourage the community to come out and enjoy this aspect of Israeli culture. Avirah is excited to announce its new end of the year showcase that will broaden the troupe’s repertoire. After the festival in Washington, D.C., the group has a couple performances, but the main focus will be the showcase on April 29 in the Memorial Chapel. The group ends one of many dance run-throughs with big smiles. (Top row, from left: James Lebovics, Jessica Morris, Moshe Ackman. Middle row: Rebecca Magazine, Hannah Weisman, Adina Schwartz, Rina Goldman. Bottom row: Sarah Paley, Sophia Godin, Alivia Barton.) Haemee Lee/Mitzpeh. 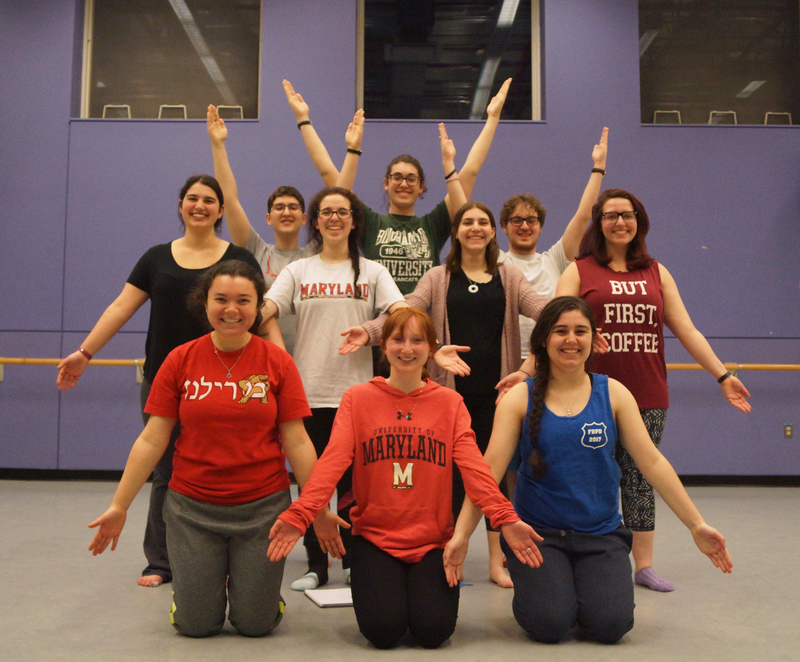 No Replies to "The roots of UMD’s Israeli dance troupe and plans for its future"